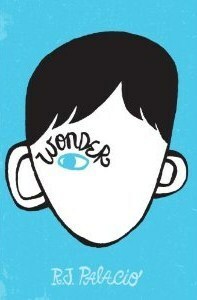 I planned on reading Wonder ever since I heard about the movie that was coming up. And I loved it! I give Wonder by R.J. Palecio five out of five hearts. I really liked it because it was well written en the characters were clearly different from one another. I only figured out later that this novel is an middle grade novel. The characters go through such a big change in their lives. Auggie learns to live with his face and to not be afraid any more. Summer is a great girl, she breaks every unwritten rule in the school about August and doesn’t care. Most of the children stay neutral when Auggie, Jack and Summer get into a fight over the behaviour of some of the children with the others, but there are some really bad kids in his class. I enjoyed it a lot that during this novel the same pieces were told from multiple perspectives, to show the reader why they behave the way they do. This was also my only negative point that because of this the pace was interrupted several times and I fell out of it a little bit. But still it was a fast read and I loved it. The movie is what inspired me to read Wonder. I like it how true the movie stays to book. From the smallest details to the bigger ones. But the difference between the movie and the book is that during the reading of the book I felt the emotions that were described, but I actually felt really hurt while watching the movie at the cruelty of the children in it. Owen Wilson and Julia Roberts are great as Auggies parents, but I think Jacob Tremblay was even better. He is a really great actor and he was also great in Room. This entry was posted in Book Review and tagged Book Review, Contemporary, Movie, R.J. Palacio. Bookmark the permalink.